I love eco-friendly toys and I've found a toy company that has eco-friendly covered in a variety of ways! Sprig Toys are actually made of a unique material, called Sprigwood, that is a durable, child-safe composite of bits of reclaimed wood and recycled plastic. Their toys are completely PAINT FREE too! Even their packaging is minimal, made from recycled chipboard and uses water-based inks. Is there anything they haven't thought of? Oh yeah, none of their toys uses ANY BATTERIES either, which can make a huge difference since we throw away 14 BILLION BATTERIES EVERY YEAR! That's enough batteries to reach the moon and back. Sprig has a variety of different toy series which are all interchangeable for even more fun. 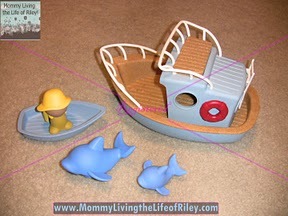 I reviewed Captain Owen's Dolphin Explorer Boat from the Adventure Series of Sprig Toys. I reviewed the Captain Owen's Dolphin Explorer Boat from Spring Toys, which retails for $29.99, but can be purchased on Amazon.com for $17.81. Sprig Toys, Inc., is an eco-friendly company dedicated to making the best toys the right way. Riley was thrilled when the Captain Owen's Dolphin Explorer Boat came for her. She couldn't wait to open it up and see what was inside. Immediately, she took to Captain Owen himself, and started calling him, "the baby". I'm assuming because he was so small, Riley thought he was a baby! She liked how the rails of the boat were very pliable and bent easily in her hands. She was also fascinated by Captain Owen's "backpack" as Riley calls it, and his removable hat. She sat down on the floor and immediately began moving all the characters around and taking their accessories off and putting them back on. Check out the minimal packaging, recycled chipboard and water-based inks used on all Sprig Toys packaging. 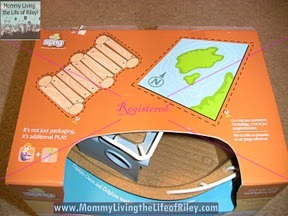 This toys packaging also served to include fun props for additional play! I thought this idea was extremely eco-friendly and fun too! Next, it was time to see if this boat was seaworthy, and I'm happy to report, "Aye!" 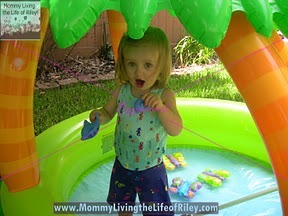 We took the Dolphin Explorer Boat out to Riley's kiddie pool and it floated just fine. It was also pretty realistic, for if you got too much water splashed up inside the boat, it SANK! 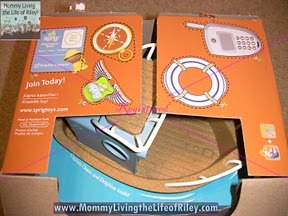 As you can see from the pictures below though, Riley's favorite characters were the Mommy and Baby Dolphins! She kept picking them up and yelling "fish", while running around! Captain Owen and the Mommy and Baby Dolphins are ready for an adventure. Riley really likes the dolphins and calls Captain Owen, "the baby". Toys powered strictly by imagination alone AND which are this environmentally conscious, definitely get my vote! 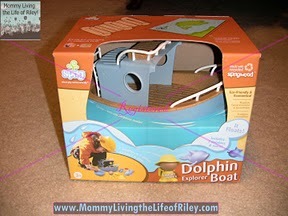 Riley loves playing with the Captain Owen's Dolphin Explorer Boat Set, both outside and in the tub. She loves playing with Captain Owen's backpack, taking off his hat, putting it back on as well as loading everyone in and out of the boat. I plan on buying more Sprig Toys for her in the future and am happy to know that my purchase is good for the environment too. 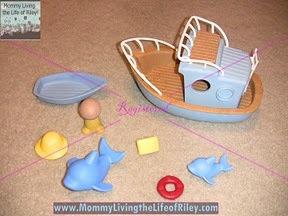 Disclosure: I received Captain Owen's Dolphin Boat from Sprig Toys in order to facilitate my review. No other compensation was received. This product review is based on my own personal experiences with this item and is completely honest and objective.